Here is spring boot basic authentication database using Spring security. During RESTful web service development, basic authentication is a primary requirement so that it is only accessible from authenticated users. Spring Security provides basic authentication using JDBC database authentication. 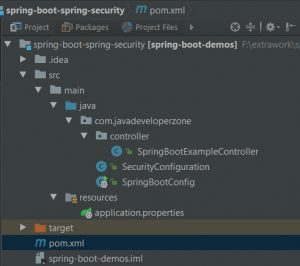 Here is a complete example of spring boot basic authentication database using spring security. It’s data source properties which contain information related to connecting with a database. app.datasource is base properties name. which has been used when autowire @ConfigurationProperties("app.datasource"). It’s spring boot startup file. Here datasource has been created which will be passed to spring security authentication object. It contains all spring security configuration related to basic authentication. Spring security by default secure all pages. Here, DataSource has been autowired which contains all properties related to database connection and pass that object to Spring security authentication builder. We have updated our article and upload source code on site.